I could not resist this color fest in the East Village in front of Porto Rico - an importer and seller of coffee. 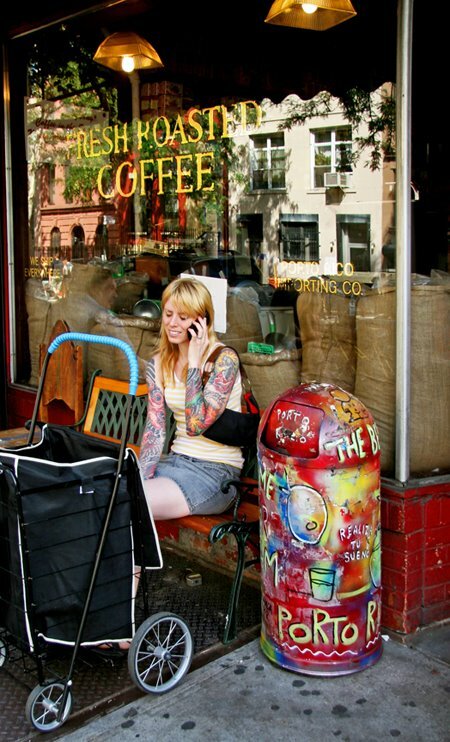 The painted trash can near this woman's tattooed arms begged for a photo to be taken. Personally I would not want to commit my skin to tattoos. But I do often admire them as artistic adornment. In principle they are really not so different from the myriad of other ways men and women have adorned themselves for millenia: hair treatments, nails, makeup, jewelry, piercings, scarification etc. However, unlike many of our more common beautification methods, tattoos are permanent (relatively), so they make a serious statement of intent and confidence. I think the full arm tattoos of today's subject may limit some of her social options - or she will be buying a large selection of long sleeve shirts. For example, she is probably no longer a good candidate for the debutante ball at the Waldorf Astoria Hotel. Perhaps this is a sacrifice she is willing to make. Related Postings: Hair Wraps, Cappuccino and Tattoo, Physical Graffiti, Fashion Forward, Fantasies.